Description: Crypt-o is a Client/Server password manager with many advanced features like strong data encryption, customizable databases, multi-user access, flexible permissions system, form filling and portable mode. Crypt-o is a secure Client/Server solution for creating custom databases, which is designed for use in enterprise networks. The data is reliably stored in Firebird SQL Server database and is encrypted using AES algorithm with 256-bit key. Description: Password Genie is a password manager that works across multiple computers and users and is designed for both security and convenience. You can easily save all of your usernames and passwords in one location which is securely protected and can only be accessed by you. Password Genie features include: Smart Logins - Multiple Users / Multiple PC's - Safe and Secure Encryption - Advanced Custom Options - Automated Backups - 24/7 Support. Description: The program for storing accounts data. The user interface is so simple, that is not need any time to begin working. Program is ideal for the personal use and allows with ease operate passwords for programs of any kind, like web browsers or email client or network resource, etc. 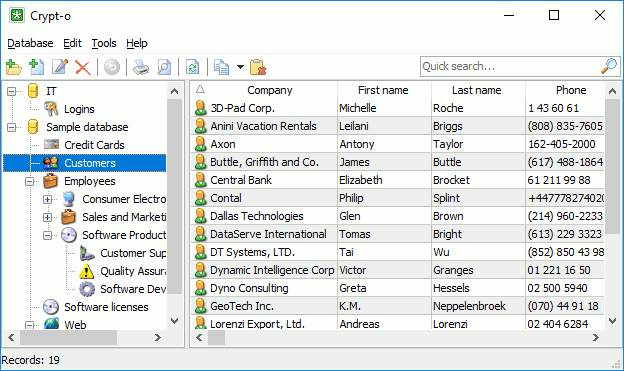 Program allows copy data like password or account name to the clipboard with one mouse click. Description: The simplest way to get random and difficult to crack passwords - is to use Passwords Generator. This program is incredibly simple in use, but the same time it allows all necessary functions. Now you can create countless set of passwords with one click. Passwords Generator has a template system, that allows adjust passwords for your needs. Templates can be saved for reuse in future. Also program allow you to export passwords to the .txt file. Description: Our pdf security remover is best application devised to unlock document even file is protected with strong 128 bit or 256 bit key password encryption. This advanced utility allows you to instantly enable pdf editing, printing, copying, form filling, signing, commenting & page extraction restrictions. Pdf password removal application supports both RC4 and AES encryption algorithms. Description: If you think that storing passwords on PCs is a mistake, this is the right password manager for you. Generate safe passwords with ease! All you need to do is specify the phrase from which you want to generate the password. Then the application will save the generated password to the clipboard and you can paste it on a web page or in a specific file.